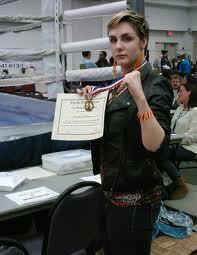 Great boxing video by artist and amateur boxer Desiree D’Alessandro! Talk about a must see video, please take the time to watch this wonderful visual tone-poem to boxing as an art form entitled Artistic Performance, Amateur Boxing and “A People To Come” as part of the Digital (De-)(Re-) Territorializations Conference by artist and amateur boxer Desiree D’Alessandro! I’d also like to send a huge shout out to the Daniel Martinez Boxing website for posting this remarkable artist’s work. The link to Desiree’s original post is here.